UP MS - News - "Business Creations Workshop"
Allow us to bring to your attention a "Business Creations Workshop" organized by the Institute of Transdisciplinary Discoveries (ITD - itdweb.hu) as an EIT Health RIS Hub. 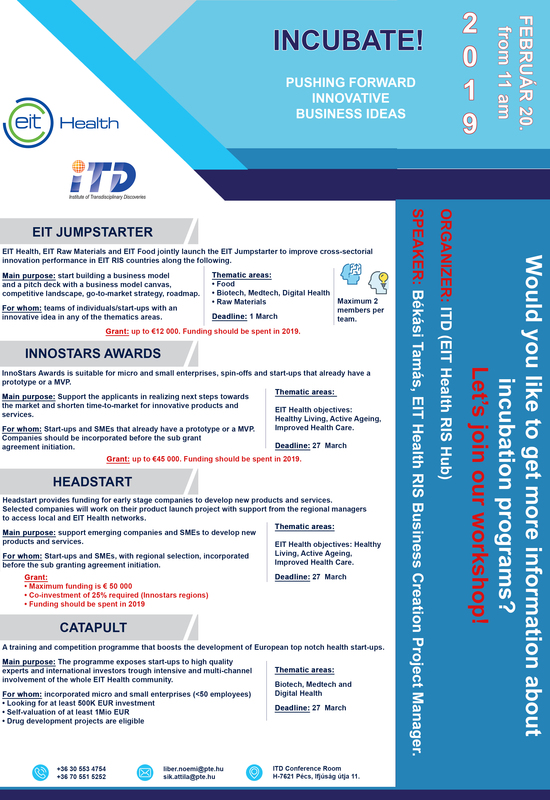 The workshop will be presented by Tamás Békási, project manager at EIT Health RIS Business Creation, and will present you with 4 types of business development opportunities on the poster below. What are the 4 Business Development Modes? Would you like to develope your business (be it at any stage - idea, business plan, prototype, incorporated company, etc.) - with very strong professional mentoring or with some money? Then? ? Participation is free, but is subject to prior registration due to the limited number of seats available.